When I blogged about mobile payments last week, I brought up the concept of a mobile wallet. Mobile wallets are the future of retail payments, but you wont get to use one any time soon! The idea behind a mobile wallet is that a customer will pay for their purchase at the point of sale with the cellular phone, rather than a credit card. Because over 90% of the US population uses a mobile phone, arguably a higher percentage than people whom even own a credit card, a mobile wallet solution boasts a potential existing user base of nearly everyone. Unlike trying to invent some payment technology from the ground up, which has worked fewer times than I have fingers on 1 hand, a mobile wallet will capitalize on existing technologies and existing products that are widely in use. Must allow me to use my existing card and bank account. Must work with my existing phone (1 software installation is acceptable). Must be just as fast or faster than using my credit card. Must provide me additional security in the event I lose my phone. This is the bare minimum for a functional mobile wallet. Note that the first 3 features stress independence from the company that supports the mobile wallet, and being able to use multiple methods to pay. This is extremely important, as there’s no chance in getting me or anyone to change card issuers, banks or anything else just because your company offers a mobile wallet. The mobile wallet must be independent of any requirement to use a specific card issuer, bank, or other service provider. One idea that is beginning to rear its ugly head, is that cellular phone companies can bypass credit card companies and banks and simply add a charge to a customer’s phone bill. While this is a fantastic idea that would eliminate one of the biggest hurdles in the entire system, there’s no possible way it’s going to work given the current customer sentiment towards cellular carriers and cellular infrastructure. Cellular companies are neither operating under a business model to grant revolving credit like a bank, nor one that would allow them to underwrite and manage businesses whom accept payments on their platform. Personally, I wouldn’t even entertain the idea of my cellular carrier becoming my bank or credit issuer! Lastly, the SMS billing systems have already shown merchants what the cellular companies think their billing service is worth, which is nearly 50% of the transaction amount. For retail merchants, 5% let alone the current 50%, is simply not acceptable. It’s going to take policy and operating changes that would rival a country switching from socialism to democracy for cellular carriers to successfully become mobile wallets providers. Being some of the largest companies on earth, I just can’t see them moving quick enough with the amount of interested that this technology has developed in a short amount of time. Consumers may drive the payment industry, but no amount of consumers is going to force retailers to pay 50% to accept a mobile payment! Throwing my cellular provider’s mobile wallet out the window, there are several areas that major hurdles must be overcome before mobile wallets are close to becoming reality. The first hurdle, and the easiest to overcome will be creating software that works on a variety of mobile phones. This software is what will interface with a merchant’s POS system or other payment capturing device. It will act as the bridge between the merchant and the customer’s payment method. Realistically this isn’t an extremely difficult technical feat considering that a vast number of mobile phones supporting Bluetooth and other communication protocols. It will simply be a matter of allowing the wallet application access to the internet and the Bluetooth or communication capabilities of the phone. Merchant based software and hardware on the other hand will be a huge problem. The easiest path for merchant to interface with the software on a phone will be some sort of 3rd party peripheral. This could easily be something the size of a PINpad and would ideally use existing connection options on the POS or terminal to communicate with the customer’s phone. The difficult part comes in trying to get the authorization through the mobile wallet platform. Many POS systems and terminal use dial or proprietary methods to connect to processor or the internet… There are 3rd party companies like gift card providers that interface with POS systems and credit card terminals, but they are very limited in the systems that can use them. While I think that this burden will be on the shoulders of the POS companies and the credit card terminal manufacturers, it’s no less daunting tank in the overall picture. Based on what I’ve observed of POS and terminal manufacturers over the past 10 years, particularly with regard to the speed that new technologies are adopted, I believe that this will end up being the final piece of the mobile wallet puzzle. The biggest hurdle for mobile wallets to work is there has to be a mechanism that would link a customers credit card and/or bank account with their phone (This hurdle is due to the bureaucracy of Visa/MC not the actual implementation). This doesn’t sound a particularly daunting task, but if you’ve worked with Visa and MasterCard and their books of regulations and operating procedures, you would know how difficult it is to go against the grain on anything related to their systems. The “grain” that I am referring to is not allowing a business to accept a payment for another business (also called factoring). In short, this means that the mobile wallet provider cannot accept the customer’s payment and then pay the merchant. The payment must go directly from customer to merchant. For the payment to go from customer to merchant, through the mobile wallet, there has to be a lot of back-end integrations and agreements between processors and platforms, card issuers, and communication platforms. The complexity of integrating with multiple processors across multiple processing platforms is well beyond the scope of any article that I can write, but it would take years to perform even by someone who knows what they are doing. If I were to bet on when we see the first mobile wallet, I think we could safely say 5 years before anything exists at all, and 10 years before it is common. This is my best case scenario based on a mobile wallet working relatively close to the above description. The exception is if Paypal makes a mobile-retail platform, which could probably exist in a few years for select retailers. This would be much simpler to implement since Paypal doesn’t have to adhere to the Visa/MC regulations as described above and they have their own platform, which would bypass the bureaucratic mess that everyone else is going to run into. However, Paypal is in its infancy in the retail world, and still has many of its own hurdles to clear. We will most likely see mobile wallets progress in steps. I would bet that we will first see Visa or MasterCard apps that link your credit card to your phone. From there we can probably expect to see 3rd parties pushing for more independent services and banks should be joining in soon after. Eventually we will need to end up with mobile wallet providers that can handle all cards and bank accounts without having to use multiple companies. Only then will we truly have a mobile wallet. Sooner or later, I believe mobile wallets become reality. I agree that more and more people own mobile phones. This is a good potential. Don’t worry desktop computers will be here for the next 50 years at least. Portable technology always comes at a higher dollar amount with less power and performance than their desktop counterparts. Until portable electronics can start outperforming traditional desktop powerhouse towers. Fools can keep dreaming about walking into an office with no computers. 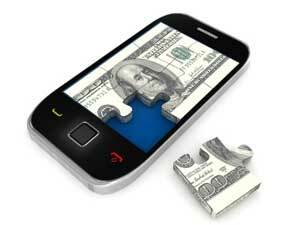 As far as mobile payments goes, this author’s blog is right on. Everyone keeps talking about this but until VI/MC can find an entity(s) willing to become responsible for all liability and security for Mobile Wallets, this is still a dream like having no desktop computers around. Even though we have the technology to do this, just like we have enough food to feed the world; we just don’t have the means to do this because this would require cooperation on so many levels between so many infrastructures.